Today marks the 3rd anniversary of the introduction of my Vegetable and Fruit Carving 101 Course for Beginners. At that time I had no idea if people would want my course or if they would buy it. Fortunately, lots and lots of people did want it and have purchased it. And even better, they have learned well! Since then, we’ve grown to offer many more video lessons. It’s been an amazing and satisfying journey so far. It’s been fun to create and share lessons and I’ve gotten a lot of satisfaction from receiving enthusiastic emails from happy students. I’ve also enjoyed watching students of my lessons grow to be skillful carvers with many of them becoming professional fruit and vegetable carvers. But whether pro or not, the common theme I most here about is how fruit and vegetable carving brings them joy. I often share students photos but today, I’d like to share some of my student’s comments that were sent to me that did not have photos. “I am thrilled to say that thanks to your videos & lessons, our 13 yr. old daughter was able to carve a beautiful watermelon rose with leaves. We featured it as the centerpiece in a large fruit buffet that we set up in her school’s Teacher Lounge – as a gesture for one teacher’s upcoming wedding. We were immediately barraged with compliments and kind words about how stunning the carving was. One of her teachers actually brought the melon into her classroom to show Sarah’s classmates what she had done! Even at the wedding, we were greeted with continued and repeated “”oohs & ahhhs”” of that watermelon, and how amazed everyone was that an 8th grader could be so talented! You helped create a wonderful memory for both our daughter and us, that we will always have – and a skill for her & I that we are excited to continue developing! We so enjoy your patient and very instructive videos and lessons – and appreciate that you continue to develop and offer them. I am having the time of my life since discovering your website. I am a Head Catering Captain and am now doing alot of carving on location. HI I REALLY LIKE IT……..AND I TRY COUPLE WATERMELON FLOWER THEY TURN OUT SO GOOD………AND I LIKE FRUIT ARRANGEMENT………. Your videos are great! I recently started to carve fruits and veggies…I must say that you make it look so easy! I’m learning so much from you and enjoying it. After I learned a few little tricks and designs I refuse to just put food in a platter without adding some flowers or little something on it. I always offer to bring something to parties I go so I get the chance to decorate something. I love it. I’ve viewed your honey dew melon carving instructions a few times and have carved 5 melons. The first one was OK but nothing to shout about. The other four did come out exceptionally well. We have a large dinner party Friday evening and I’ll do anther one and some of your other instructional pieces. it is a pleasure to watch your lessons, I enjoy them all. I am having lots of fun with the melons and watermelons carving. And yes I believe you,when you get in to the roses carving you forget about any problem you ever had in your life. Any time I am feeling a little down, I grab any fruit I can find in the fridge and I carve roses on it. Best therapy ever, for sure. Thank you, I wish I would have found you earlier. Hi Nita, you made it so easy for me to carve the turnips and beets flowers. Before your video I thought it was impossible for me to do the flowers, but with your video I was able to do few of them. I have been practicing my carvings. 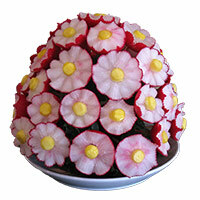 I have made radish roses, and lotus flowers, potato flowers, calla lillies, leek flowers. Also lotus flowers from onions and I have carved two roses on a honeydew melon. I am truly enjoying my lessons. I was intimidated to try the honeydew flowers, but I dug in and was pleasingly surprised by the results. I also did the beet and turnip roses. 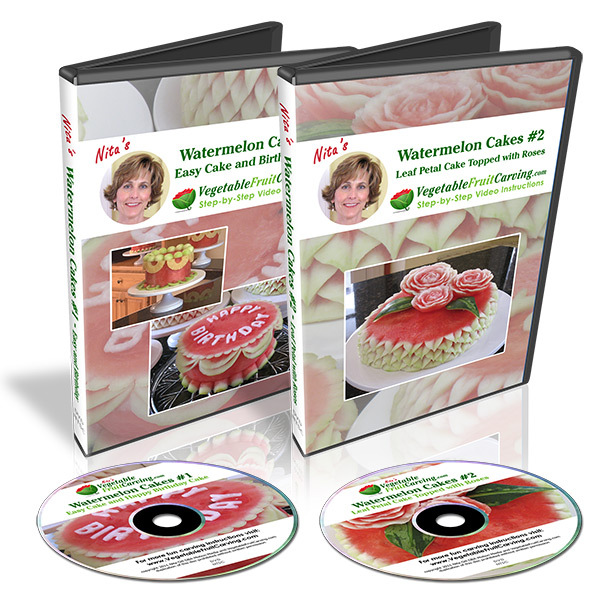 I look forward to making my first watermelon cake. “Thank you Nita and all the readers for your kind words. I love my job and find it so relaxing. All of the things I have made for this display, I have learned from Nita’s collection of educational videos. The best relaxation for me is one of Nita’s DVD’s, my knives and a pot of espresso. 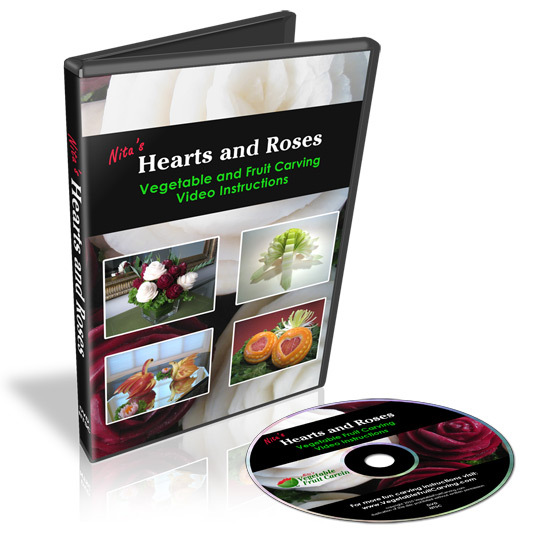 I have bought so many DVD’s from so many people, But I will say Nita has the best techniques and the best way of expressing what and how to do it. Her online store ships instantly and arrives in a day or so. Don’t be afraid to have fun, if all else fails you can just eat it. you, I really appreciate your time and effort for showing me how to do this. I wouldn’t have been able to do It without you! A big THANK YOU goes out to all of my many student / customers who have sent me photos and enthusiastic email expressing their love of carving. Your interest and willingness to learn and your sharing of your photos and experiences with me adds joy to my life. I have found your CDs right after you started selling them. I decided to buy them just to improve my skills for the carving hobby I had. At that point I did not know it will become my business. Thanks for your help in getting such a satisfying job. Thanks for your kind words Aneta. It’s a great thing to love your job, isn’t it? Thank you so much Basia. Parabéns pelo aniversário,e que se repita por muitos anos.